I still remember my first visit to Alaska. Not for a vacation. But for a job interview. My interviewer was trying to sell me on the idea of moving to Alaska (it worked by the way!). He talked about the pros and cons of life in Alaska. But one selling point he mentioned, stood out. The Northern Lights. 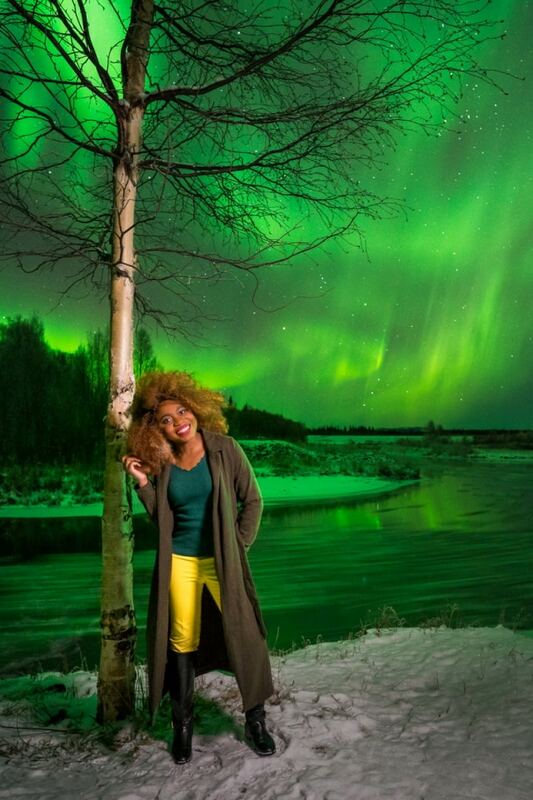 I had no idea the aurora existed or that Northern Lights were a sight to behold. I really had no idea what the northern light was. Back at my hotel, I searched online and was speechless by the photos I saw. I came at the beginning of April and kept looking out the window hoping to magically catch a glimpse of the aurora like an expected pizza delivery. I left Fairbanks, Alaska disappointed. But… I relocated to Alaska a few short months later for that job. Since then, I’ve called Alaska home for a few years now. 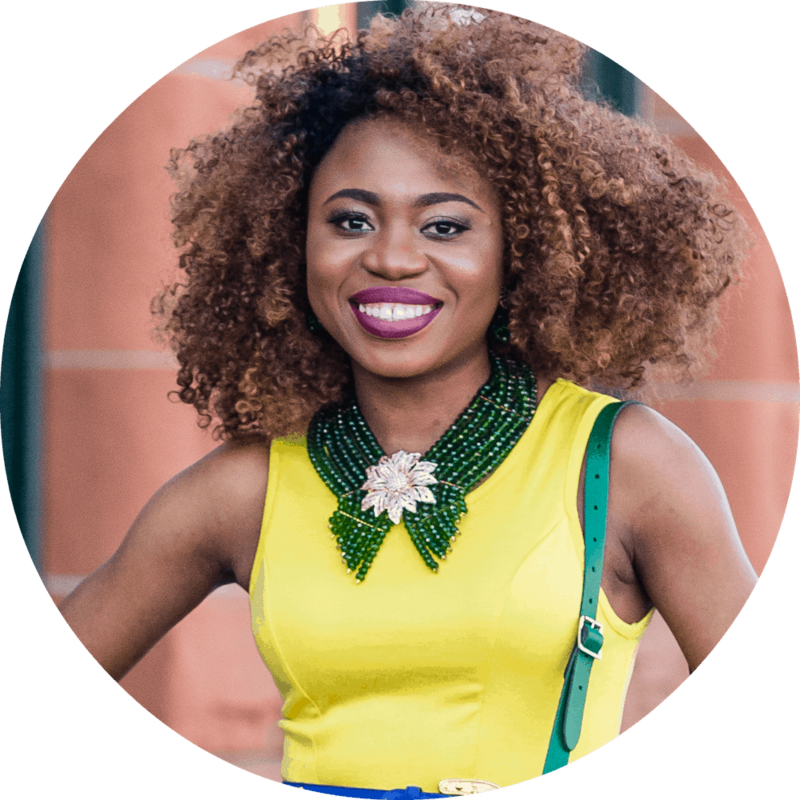 I routinely get questions about life in Alaska like what to wear on a trip or cruise (packing guide) or what fun things to do in Alaska. 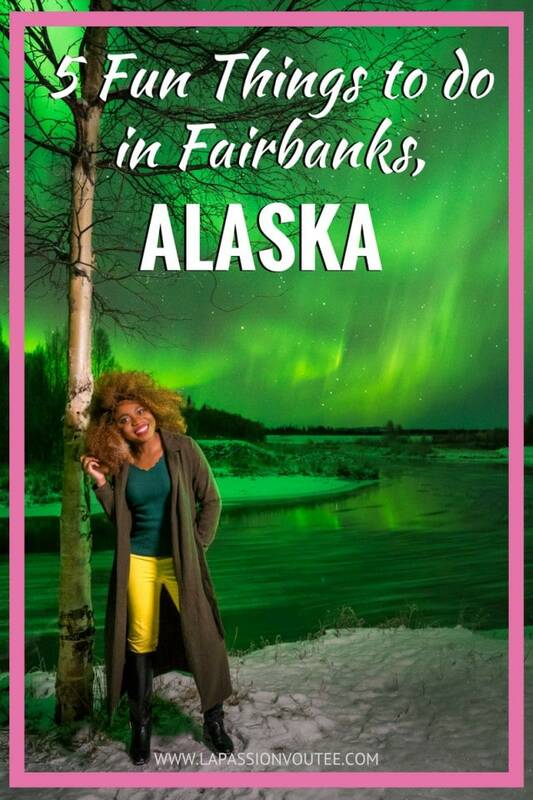 In this post, I am sharing 5 unique things to do on a visit to Fairbanks, Alaska. Getting a keepsake portrait under the Northern Lights – Of course, this ranks #1 on my list. The aurora borealis is nothing short of phenomenal. After 3 years of living in Fairbanks (you tend to take the wonders of where you live for granted), I had seen the Northern Lights too many times to count. But one thing was missing! A photo of me + the aurora. You see, the aurora is just as elusive as it is breathtaking. You get your cell phone or digital camera hoping to capture this magnificent beauty only to see a pitch black photo! 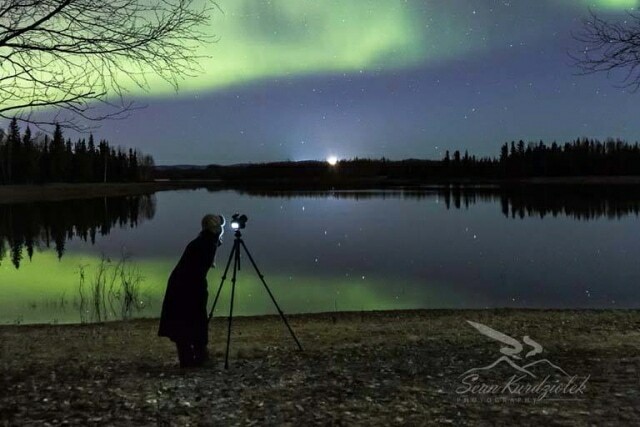 It takes special knowledge to be able to capture the aurora on your DSLR. A photo of you and the aurora is a must and Sean Kurdziolek is your guy. His specialty is shooting aurora portraits but his spots fill up quickly every year. Sean Kurdziolek and his wife, Amanda are really kind and on their A-game! They will tell you everything you need to know (what to wear, what to expect…) so you’re prepared for an experience of a lifetime. Chena Hot Springs resort – When I first arrived in Fairbanks, visiting Chena Hot Springs was one of the top recommendations by locales. I visited in October after the first few snow showers and absolutely loved it. Chena Hot Springs is about 60 miles from Fairbanks so you’ll need a rental car to get there. The roads are good but phone network is patchy. During the winter months, we have limited daylight so plan to visit earlier in the day to give you enough time to enjoy the hot springs and return back to Fairbanks. While you’re there, check out the Aurora Ice Museum. The museum was closed when I visited. Visit the Arctic Circle – Visiting the arctic circle has been on my bucket list for a little while now. I liken it to visiting the Four Corners Monument, where you can stand in four states at once: Arizona, Colorado, New Mexico and Utah. Visiting the Arctic Circle will require planning if it’s a trip you want to embark on your own because it is a long drive with limited gas stations along the way. You don’t want to get stranded. Luckily, the Arctic Circle Tour will get you there and back while on your visit to Fairbanks, Alaska. The World Ice Art Championships – The BP World Ice Art Championships is the largest ice sculpting competition in the world! And it happens right here in Fairbanks. If you plan on visiting Alaska in February or March, which are great aurora viewing months, you should plan on visiting the ICe Art Championships. They even have covered, heated tents to get you feeling warm. The sculptures are magnificent. You might see a few polar bears sculptures en route to University of Alaska – Fairbanks (UAF) as well as on campus. The showcase dates are subject to change as it all depends on how cold or warm the weather is. Visit Ice Alaska’s website for schedule details. 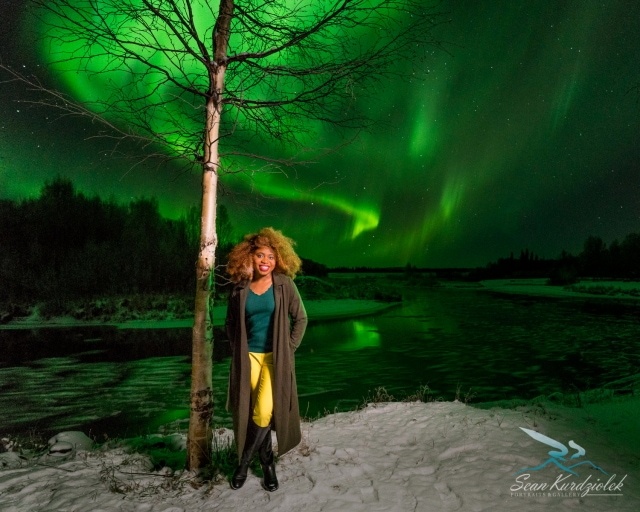 Aurora Workshop – If you have a love for photography or just want to capture the Northern Lights while on your visit to Alaska, sign up for this aurora workshop. 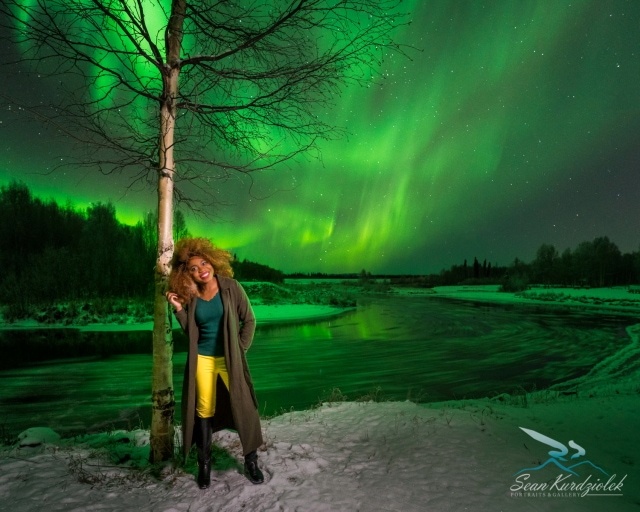 Sean offers limited workshops for aurora enthusiasts. One visit to his gallery to see his work and you’ll never want to leave. Sean Kurdziolek’s gallery is located in North Pole, Alaska which is about a 25 minutes drive from the airport. You’ll be mesmerized by his work. And if photography is not your thing, you can get holiday cards and postcards to send to your friends. Other fun things to see and do in Fairbanks in the winter include dog sledding, hiking on a glacier, ice-fishing, and watching the Iditarod sled dog race live! Fairbanks might be a small town but it is Alaska’s second largest metropolis. This little piece of interior Alaska is packed full of adventure and rich in culture. The photos are pretty nice and surreal. 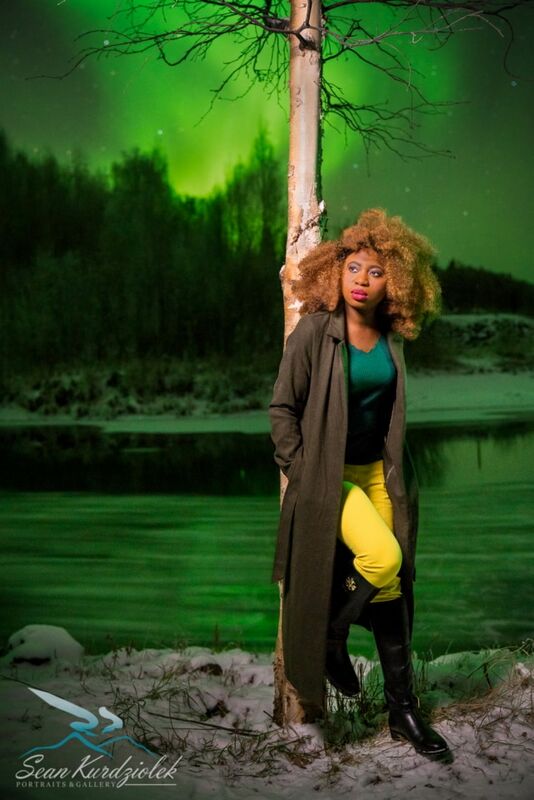 The choice of colour of your outfit goes perfectly with the aurora…I guess it was an intentional choice? Nice write-up! Thank you, Lola. It was an unplanned match 🙂 Thanks for stopping by! 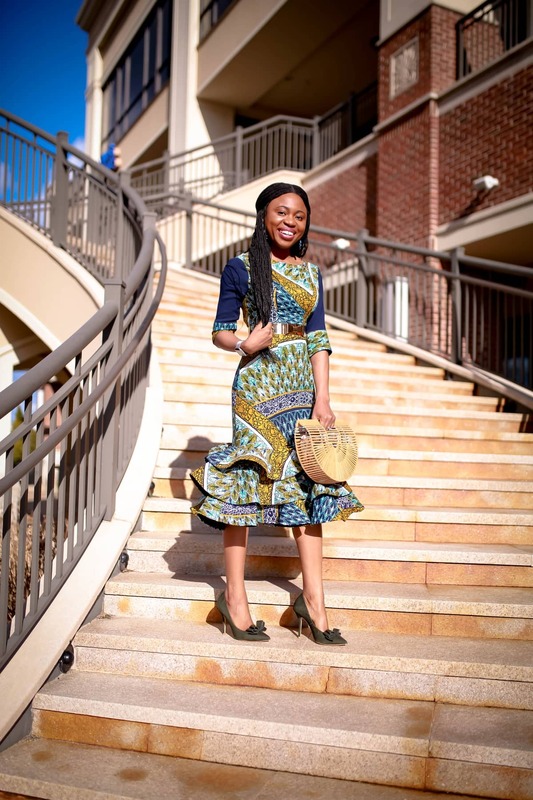 I saw a post of you on Pintress then it let me to your blog, absolute love your style, my figure is very similar to yours, so it gave me great ideas on how to put together outfits to flatter my body type. Oh my goodness this is amazing! I haven’ thad the chance to see the aurora borealis yet so this surely makes me jelly 😉 I love the shots they’ve made on you too and you’re lucky to have witnessed it as well! Some of my friends have never had the chance after several tries.Hopefully I get to see it too soon! These images are breath taking. And your outfit absolutely compliments the background. Nice one LPV. My goodness! These images are breathtaking! I have always wanted to see the Northern Lights. It’s definitely on my bucket list! Alaska has always been of great intrigue to me. Thank you for sharing so many wonderful things to see and do there! Ah I saw that photo on Instagram and it is SO STUNNING. Green is my favorite color, too; so of course I am all *drool* over here. I have four states left to visit and Alaska is one of them. I am getting one done next month (Maine) and I hope next year in August I can get to Alaska. Though, LOL, I admit I’ve always wanted to go to the World Ice Art Championships! So cool you live in AK. Definitely will be following along on more of your adventures. I have always wanted to visit Alaska. My parents went once and enjoyed it. 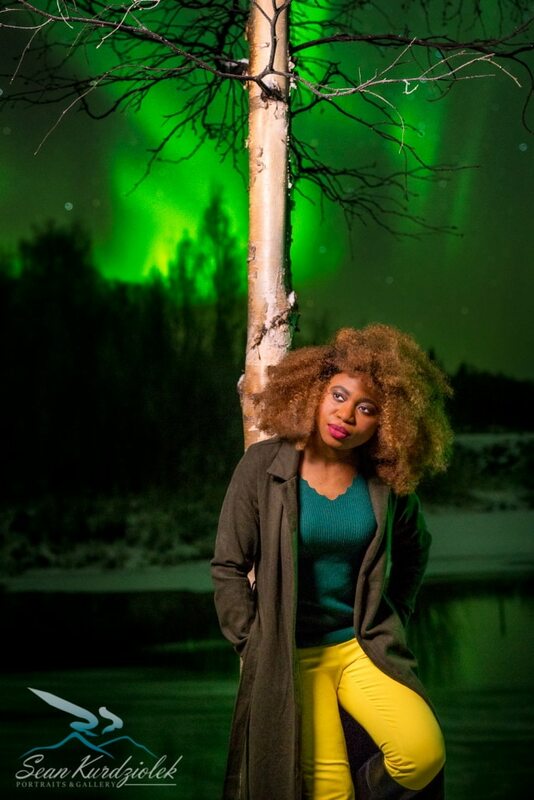 Your Northern Light pictures are amazing! I didn’t realize how green they are! You have left me wanting to plan a trip so I can come to see them. These pictures are nothing short of amazing! They make me want to refresh my skills on off-camera-flash photography. I would love to visit the Northern Lights in person! Omg this is gorgeous!!! So dreamy!